When we moved from Virginia to Tennessee I was so excited to house hunt. I had my list of must have’s and it was long. So of course since our budget was not unlimited I had to compromise on some things. One thing I compromised on that I would not repeat was the fact that our kitchen doesn’t have a pantry. There is a ton of cabinet space but keeping food in cabinets just isn’t as convenient as having a pantry. Since a good bit of our cabinets are devoted to food we’ve found ourself with little appliances and tupperware everywhere. That’s when we decided to change our coat closet into a pantry. We opted to only put in one shelf at this time. Because the coat closet is under the stairs it goes pretty far back which makes for a really deep shelf. We’ve been able to put a lot of stuff on the shelf which has cleared off our counters and above our cabinets. In the future if we decide to we can add more shelves using the same instructions we’re sharing with you today. So now over to Tyler who will tell you how we went about changing our coat closet into a pantry! I’m no professional blogger like my wife, but I can build a mean set of shelves and go from cluttered to organized in about 4 hours with the best of them. That was the task my lovely wife handed me. 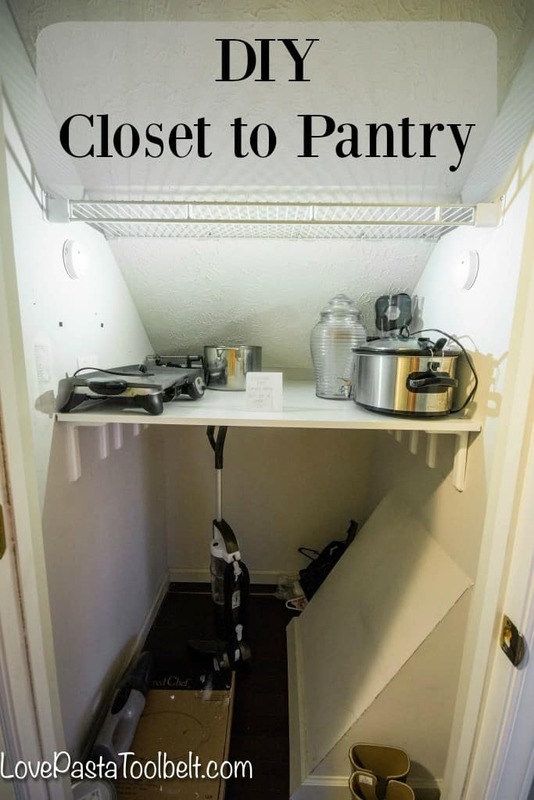 Build some shelves in our hall closet, transforming it from an un-used coat collector, into one of our #1 priorities on our home shopping list – A pantry!! With this being a former coat closet, the lighting situation left a lot to be desired. It’s not like you need a ton of light in a pantry, but at least a little is required. We picked up some GE motion activated LED lights that run on AAA batteries, which are included. They are magnetic, and offer a screw hole on the back so you can hang them from a screw if you wish. They were a little finicky to get put back together after I installed the batteries – I had to make sure the on/off/auto switch lined up properly with the outer housing so that the lights would function. After a little trial and error we got them on, no problem. At first I mounted them magnetically to the wire shelf that we kept in the closet, like you see in the video – but eventually I used the included magnet strip with adhesive to attach them to the walls on either side of the shelf. Step 2/3.. Drilling Pilot Holes (and Drywall Anchors)! Any excuse to use my tools, and she won’t have much argument out of me whenever Emily needs something done. In this case I measured out the bracket locations and spaced them +/- 3″ from the front and back of each shelf (we are installing 3 shelves on the same level to make the overall shelf 36″ deep with 3 12″ pieces.) I say +/- because I was low on drywall anchors, and wanted to utilize as many of the wood wall studs as I could. In the end, (2) brackets on each side of the closet ended up hitting wall studs. The rest required I use drywall anchors. I prefer to install these with the drill, but just make sure to baby it and don’t ram them into the wall or they will break. I got them about 95% of the way, then used a screw driver to tighten them down gently. Emily and I found some nice brackets that had a plastic cover on them. These would really be ideal for any location that the bracket will be seen, as it covers the screw heads and gives a nice clean look – totally unnecessary in our set up, but hey – don’t take me to the hardware store and expect me not to buy the coolest brackets I can find. I proceeded to install the brackets on my pilot holes or in my drywall anchors making sure that they were level vertically, and maintaining the same height horizontally so that our shelves would all line up since we had 3 shelf pieces (I was SOOOO close too.. more on that later). 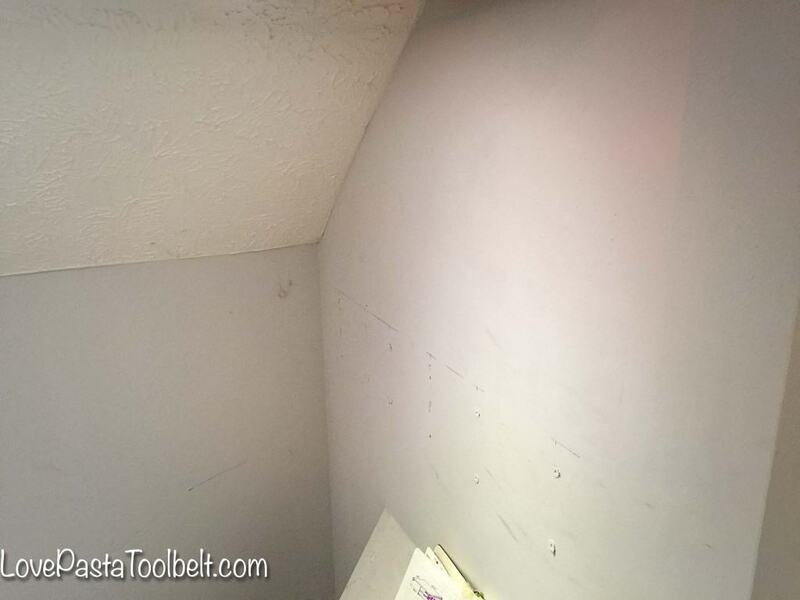 We purchased 12″x48″ melamine shelves, knowing we wanted a shelf that was 36″ deep x 43-1/8″ wide. 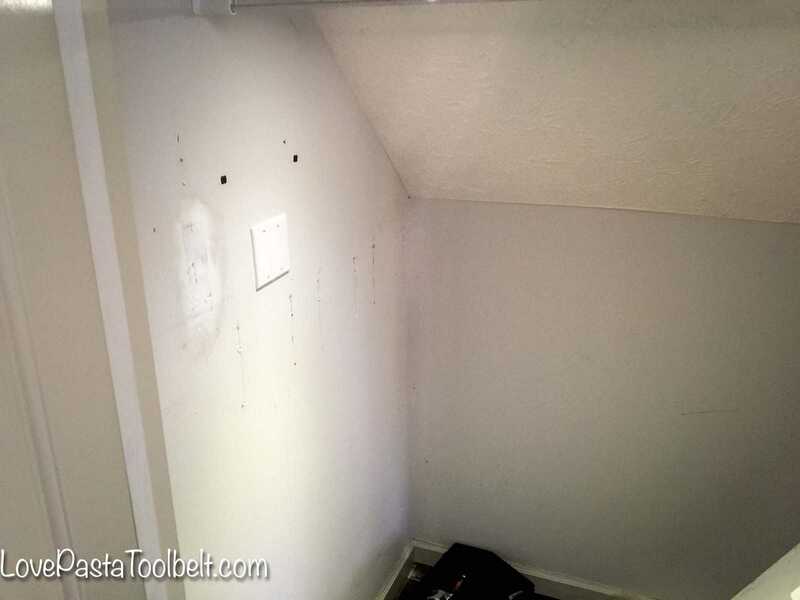 The overall opening in our closet was about 43-1/4 to 43 – 3/8″ front to back (the wall was not square) – so make sure you measure the front of the shelf system and the back of the shelf system if you are doing a set up like we did. As good as us construction workers are, sometimes we frame walls crooked. Not me of course, but just FYI! I took the smaller measurement (43-1/4″) and cut the wood about 1/8″ shy of that to 43-1/8″. This would allow the shelves to go in easy and I knew I was caulking the wall to shelf joint later on so it wouldn’t matter if there was a slight gap. QUICK TIP – The shelves wanted to slide on my when I was cutting them. To prevent this, just take a couple nails and hammer them into your table that you are cutting on to make a temporary stop that will keep the shelf in place while you cut! After cutting each shelf, give it a dry run. Its possible you measured the opening wrong or measured your cut wrong. Its good to double check everything before you continue along down the wrong path. After you have all your shelves cut, and test-fit them. Set them all in the closet on the brackets and mark them through the bracket holes. You are going to want to add some screws through the bracket and into the shelf to help prevent the shelves from moving around, but to also tighten everything down to give it a nice clean look. For our pantry shelves, I used 1″ screws through the top of the board and then put small nuts on the bottom of the screws. Another way you can do it is to use 1/2″ screws and screw from the under-side of the shelf and not have any screw heads visible on the top of the shelf. Being that we were going to load this shelf down with less-than-often used kitchen equipment and that I had the 1″ screws left over in the garage from another project, I decided to go down from the top. If the shelf will not be overly crowded, I would suggest going at it from the bottom, and hiding the screws from view. Now that you have your bracket holes marked out, take the shelves back out and drill the pilot holes for the screws. If you are going up from the bottom to conceal the heads you won’t want to go through the shelf with the pilot holes, you just want to start a hole and make sure its about 1/4-1/2 way through the shelf – don’t go all the way through! You will have holes in the top of your shelf if you do that. In my case, I needed to go all the way through since I was installing my screws from the top. With the pilot holes drilled, re-set all the shelf pieces on the brackets and lock it down with your screws. QUICK TIP – At this point, your shelves should be sitting level if your brackets were installed right. My front brackets were just slightly too low. So I made some shims out of plywood I had in the garage. Being that plywood is a bunch of layers of laminate glued together, you can use a putty knife to make some quick DIY shims. You could always use this as an excuse to go back to the hardware store and buy some shims. Believe me, that crossed my mind! To finish off the shelf and give it a clean look, I caulked the joints of the shelves and the wall. Remember I cut the shelves a little short to make them fit easy. This gap needs to be closed, so in comes the caulk. Running a bead down each side, then smoothing it out with your finger will provide a great look that blends in perfectly. QUICK TIP – Use painters tape and add a piece 1/4″ up the wall and 1/4″ onto the shelf to make a 1/4×1/4 “L” shape for your caulk bead. Using painters tape makes the clean up super simple! You can check out this video to see Tyler at work building our pantry! Have you ever converted a closet or space into a pantry for more storage space? Awesome project! Before we bought our current house, I swore I would never buy a house without a pantry again…but lo and behold, no pantry here. 🙁 Maybe I should do this to our coat closet which is right next to the kitchen!